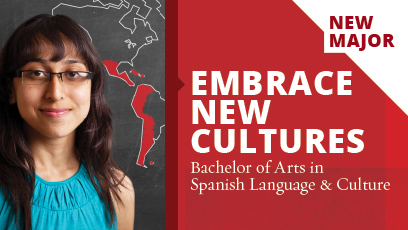 REDDING, Calif. - Simpson University is pleased to announce the addition of a four-year bachelor’s degree in Spanish Language and Culture to its traditional undergraduate studies in fall 2014. The program is designed to help respond to growing demand from businesses, schools and governments for employees proficient in Spanish, administrators said. The university has a Spanish minor, which has grown to nearly 20 students in six years. A proposal to turn it into a major was submitted by the Communication Department and underwent a rigorous research and review process before it was approved this fall by the President’s Cabinet. Simpson also offers a Spanish journalism concentration within its communication major. The Spanish major’s 2014 roll-out will coincide with a revised general education curriculum for all traditional undergraduate students, who numbered 787 in fall 2013. The restructured general education courses mean students will have more room in their schedule for a double major, said Dr. Ann Miller, associate provost. The new major also will complement the university’s service-oriented programs and activities, said Debora Rager, assistant professor of Spanish. Founded in 1921, Simpson’s longstanding motto has been “Gateway to World Service.” Each year, dozens of student-led teams travel around the world on service trips. Core courses in the Spanish Language and Culture degree will include Film in Spain and Latin America, Oral Communication in Spanish, Advanced Spanish Grammar (and Composition), Civilization and Culture of Spain (and Latin America), Literature of Spain (and Latin America), and Communicating Cross-Culturally. For more information about the program, visit simpsonu.edu/spanish.